Here’s another date for your diary as Mark Elliott of International Yacht Collection plans to hold an open house aboard Trinity’s 53.9m Katharine on June 18th. Taking place between 4.30 and 7.30pm, there’ll be heavy hors d’oeuvers (hungry brokers and clients welcome), cocktails and live entertainment at Bahia Mar’s North Face Dock. Built in 2001, Katharine features new Quantum zero-speed stabilisers, rebuilt main engines, fresh paint and updated interior soft furnishings. 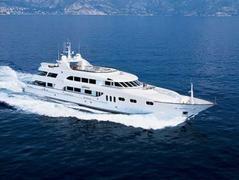 Accommodating 12 guests in six staterooms, her asking price is $29.9 million.